The National Minority Quality Forum (The Forum) commends the Food and Drug Administration upon the release of the FDA Action Plan to Enhance the Collection and Availability of Demographic Subgroup Data, which is mandated by Section 907 of the 2012 Food and Drug Administration Safety and Innovation Act (FDASIA). The Forum welcomes this next chapter in FDA’s commitment to improve their ability to assure that FDA-regulated medical products are safe and effective for the American general population of the 21st century and beyond. The FDA Action Plan to Enhance the Collection and Availability of Demographic Subgroup Datais a step in the right direction. But the planning journey is far from complete. We encourage all advocacy organizations representing patients and healthcare consumers to submit comments as well. FDA has opened a docket to solicit public comments on the action plan and will plan additional opportunities for the members of the public to provide their input on various action items in the plan.” The docket closes at 11:59 PM on October 21, 2014. In addition, the FDA FDASIA Section 907 webpage references an email address to which comments can be submitted: FDASIA907@fda.hhs.gov. The National Minority Quality Forum offers the following general and specific comments on theFDA Action Plan to Enhance the Collection and Availability of Demographic Subgroup Data. The emerging healthcare market in the US is composed of population groups who continue to be underrepresented in clinical research, and about whom system performance and outcome measures are disturbingly silent. Absent enhancements in the collection and analysis of data that reflect the entirety and diversity of the American demographic of the 21st century and beyond, reform efforts designed to improve the quality and cost-effectiveness of our health services delivery system are destined to fail the American healthcare consumer. This cannot be permitted. The FDA Action Plan to Enhance the Collection and Availability of Demographic Subgroup Datasets the stage for the structured, formal engagement of all essential stakeholders in a reconsideration and redesign of the manner in which public and private researchers collect, analyze, and report data on biomedical research that supports applications for FDA-regulated medical products. This redesign is essential to redress the weaknesses in current approaches to evidence development that enable, and sometimes incentivize, the inappropriate exclusion of affected demographic groups from research that will inform the design of drugs, biologics and devices that they will, and often must, purchase to protect their health. These excluded demographic groups, referenced as demographic subgroups in FDASIA, can include women; racial and ethnic groups other than Caucasian, non-Hispanic; older adults; and individuals with different co-morbid diseases and conditions. Measures of success and effectiveness, therefore, must include not only short-term (and in our view short-sighted, and often misguided) financial indicators, but also process and outcome quality measures that will enable evaluation of the impact of the research, delivery and financing system through the lens of all demographic groups. Improving the collection of data within the universe that is guided by FDA policy and regulations is a critical component of a new, and essential, data paradigm. These new evidence constructs must be enabled not only by a more inclusive and expansive approach to data collection and analysis, but also by a lexicon of inclusiveness that is clear, concise, and, at a minimum, employed consistently across all federal agencies and stakeholders. The language contortions and lack of clarity or consistency in terminology throughout the FDA Action Plan are symptomatic of the challenges that attend this issue. Of particular interest to the National Minority Quality Forum is the plan for CDER and CBER to revise the guidance on the Integrated Summary of Effectiveness (ISE) sections of new drug applications (NDA), and biologics license applications (BLA), with particular attention to the importance of demographic and other subgroup analyses. Consideration (FDA states) is also being given to developing guidance on the Integrated Summary of Safety (ISS). We strongly encourage FDA to develop this guidance, as well. Of particular interest is FDA’s stated plan to work, to the extent possible, towards better standardization of data collection categories for age, racial and ethnic group in submitted applications to facilitate harmonized data collection and analysis of subgroup outcome trends. The Forum strongly supports FDA’s plan to revise the FDA MedWatch forms to enable a standardized collection of demographic information on possible adverse events that occur after medical products are broadly available on the U.S. market. We also support FDA’s plan to strengthen systems and infrastructure, including the Mini-Sentinel pilot, to make better use of data once products are broadly available on the U.S. market. The National Minority Quality Forum strongly supports FDA’s plan to explore the manner in which exclusion criteria are used in clinical trial protocols. It is essential to identify and remove unnecessary exclusions, with the goal of leading to trials that assess safety and effectiveness in more representative segments of the American healthcare consumer population. 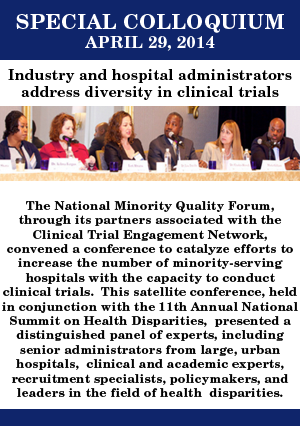 The National Minority Quality Forum strongly supports action items 2.3 and 2.4 and looks forward to working with FDA, NIH and other DHHS agencies and external stakeholders to implement proactive efforts to increase participation of all demographic subgroups in clinical trials, with particular emphasis on those population groups who are historically underrepresented in research. This action step, in our view, represents the essence of real transparency. The National Minority Quality Forum commends FDA’s leadership in taking this step to help assure that all Americans, regardless of their relationship to the research and approval processes, will have access to this information. Key to the success of this action, of course, will be assuring that the information is posted in a timely manner, and is readily accessible by, and can be analyzed and interpreted by, all audiences. FDA notes that they are “…also considering how to consistently communicate meaningful information on demographic subgroups in medical product labeling, as applicable.” The National Minority Quality Forum encourages FDA to assign priority to this action, as well. The National Minority Quality Forum encourages all healthcare consumer and patient advocacy groups to submit comments on this FDA Action Plan to help insure that the final version is devoid of ambiguities or contradictions in approach, concepts or language. We must all engage with FDA, the entire family of DHHS agencies, and external stakeholders to establish a clear path toward the design of initiatives and implementation of actions that redress long-held inequities between and among demographic subgroups of the American general population. We look forward to working with the Food and Drug Administration on the implementation of the final FDA Action Plan to Enhance the Collection and Availability of Demographic Subgroup Data. Please direct any comments or questions about this statement to Gretchen C. Wartman, Vice President for Policy, National Minority Quality Forum (gwartman@nmqf.org or 202-223-7560).